As the second round of my Radio project slogs along, it was nice to be rewarded with three good new-to-me stations to be able to add for my readers to try out. All of these come from Louisiana. The Bayou State is a tough nut to crack as far as streaming radio goes because many of the stations there are terribly underfunded and located in very small markets. Thus, many do not stream or even have a website to look at. Many others are run on a shoestring budget with stations left on auto-pilot playing the same old thing and never even giving a hint of the rich culture of their home state. Click on the logo to visit the KMRC Radio website. KMRC is located in Morgan City, Louisiana. It is officially designated as part of the Houma market although that is sort of a sub-market of New Orleans. KMRC is a rarity for two reasons. First, it is one of the very few AM stations listed on my Radio page (although the online stream sounds just as good as one from an FM station). Second, it is the only radio station I have linked with a “swamp pop” format which I can only describe as sort of a rockin’ electrified Cajun style of music. It’s really great stuff so, despite being a commercial station, I believe that many of my readers will really enjoy it. NOTE 2015.07.19: KMRC has been removed from my Radio page. It has been several months since the stream worked and the station is apparently not going to fix it any time soon. Click on the logo to visit the KXOR-FM – LA 106.3 Rock Hits Radio website. 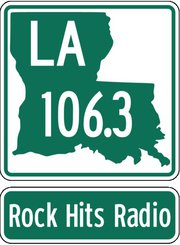 KXOR-FM, better known as LA 106.3 Rock Hits Radio, is licensed to Thibodaux, Louisiana which is also part of the Houma market. I have had this station in my bookmarks for a very long time, probably first saved from being part of an old sports network or even in preparation for a hurricane strike. Previously, KXOR-FM was a very standard and not terribly noteworthy blend between a “classic hard rock” and “active rock” station. However, it seems they have recently taken a wider tack in their playlist and toned down the “Oh, dude, we rock so hard” pinhead attitude to let the music speak for itself. Sure, they still play hard rock but a lot more “classic” material of all types has been put into the mix. I also like how they have dumped their previous X-style logo (because, of course, anything with an X in it is edgy, dangerous, and naughty…jeez) and used a version of the Louisiana State Highway shield even down to the correct fonts (although that design is now being phased out to a black-and-white version). While a small detail, it is a good way to set a tone that a station is local and cares about the immediate community. This is obviously a commercial station in a world filled with “classic rock” outlets and I believe it is also put on “auto-pilot” at times. Still, it is one of the better stations of its type out there right now and is quickly becoming one of my favorites to turn to when I want something familiar but still rockin’. NOTE 2017.03.24: KXOR-FM has been removed from my radio page as it no longer offers an online stream. Click on the logo to visit the WTUL website. If any of my readers wonder why I would torture myself to go through all of the world’s English-language radio stations again to get the ones I missed the first time I was crazy enough to pull such a stunt, WTUL would be a prime example. I am fairly certain that the corrupted database I had while I was still using Windows preventing me from listening to some streams was the reason why I did not post this great station sooner. While mostly staffed by the students of the station’s owner, the prestigious Tulane University in New Orleans, there are also enough other volunteers contributing to the programming that I decided this was best classified as a “community/variety” station rather than a college radio outlet. The variety of programming on this station is mind-blowing. For one example, on the day I am writing this, two hours of very interesting children’s music was followed by two hours of opera, then two hours of folk, then two hours of a show called Hayride to Hell which was almost impossible to describe but was a hoot to listen to anyway. Very similar to WWOZ that I wrote about in my previous entry, WTUL (along with the entire Tulane campus) was hit very hard by Hurricane Katrina. The station struggled hard to remain active but, at least online, remained on the air thanks to assistance from Stanford University in California. WTUL resumed over-the-air broadcasting in December 2005 and is still fighting back with an amazing spirit. If any of my readers have wondered about this…yes, I do listen to all of the stations I link to on my Radio page periodically. Of course, there are some I listen to much more than others. Still, I like to take occasions such as this to check in on all of the stations I have linked from a certain state or broadcasting a certain format to make sure there have not been any changes. I did this today for all of the stations I have linked from Louisiana. Sadly, I must report that I found one that I felt must be removed. KLSU in Baton Rouge, the station owned and operated by Louisiana State University, no longer meets my standards. I feel that their programming has become too similar and, worst of all, they have begun running on “auto-pilot” every night. In a city that is as diverse and musically rich as Baton Rouge, it is a shame that a university as huge as LSU does not take the same tack as one such as Tulane with WTUL to invite members of the community to contribute fresh, vibrant programming instead of just burning electricity to do nothing but basically broadcast somebody’s crappy iPod playlist. Posted in Media, Music, RadioTagged Cajun, classic rock, Houma, KMRC, KXOR-FM, Louisiana, Morgan City, New Orleans, swamp pop, Thibodaux, Tulane, WTULBookmark the permalink.